I'm a tummy toesies kinda girl. It looks like I'm all legs and belly! And yes, mine fur is as soft as it looks. 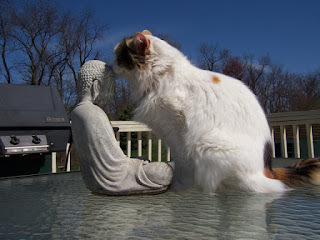 I wuz appreciating the fine Spring day this past weekend here in Connectacat. Dat wuz until I got a little owt of control and had to be put back inside by da marshal. 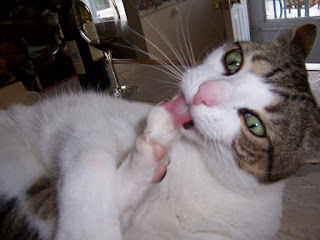 As a mancat, we like to keep owr paws and toes in tip top shape. Nuffin worse dan a mancat wif baffroom materials stuck in between his toes if yoo know what I mean. In order to do a pursonal man-a -cure first yoo has to get in da right pawsition. Yoo can make silly faces if it helps yoo to reely dive into it. It becomes a soothing process almost so dat yoo kinda go into da 'zone'. Make sure yoo spread da toes apart as far as you can so as to get all dirt an litter box materials owt of da way. Make sure yoo lik dem reely clean. 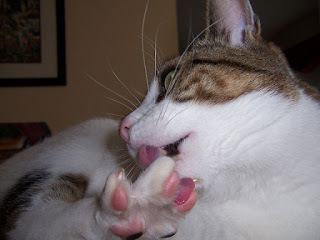 Now for da close up to sow yoo how purfectly clean a man cats paws can be. Saturday stuff. Spring cleaning. All things that smell. All things that are gonna smell pretty bad pretty soon. 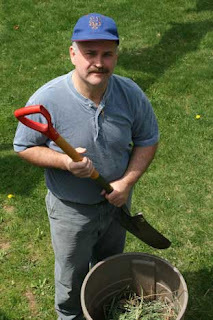 Owr town had a speshul for Earth Day for town rezidents to get a compost bin for only a few green papers. Such a deal. 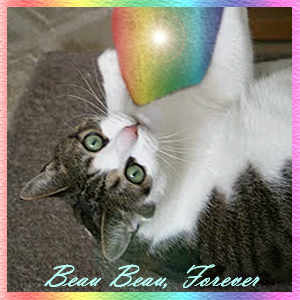 We are furry appreciative dat we gots somefin for a deal and dat will help owt da world. 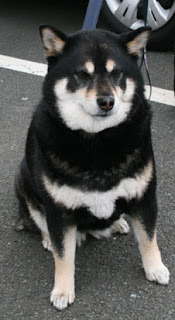 Plus while they were there they met some people and a furry nice woofie! We loves owr town. Dis is a nice sweet pretty woofie girl that wuz waiting while her Mom got a compost bin too. We weren't there but we knows a woofie when we smells one. Her mom says she gets along wif cats so she must be a good woofie. Isn't she a beauty? 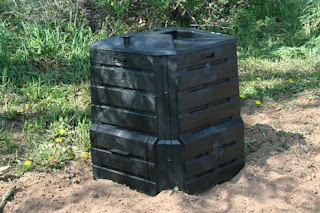 Here is da new compost bin. Composting is very beneficial for da environment. It reduces how much garbage we has. But wait - isn't dat what I am for - to dlean up all da food dat hits da floor? Now instead of Mom frowing away all da left overs she will be putting dem in a little bucket for me to eat to save it all up and put in da compost box till it gets all stinky. Finally it will turn into black stuff dat is reeely good for da garden to help grow more food for me for all of us. Dad bean is a furry happy compostin' farmer kinda guy today. 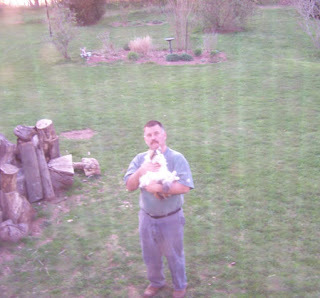 He likes to grow owr own food. Happy Spring efurryone! Errrmmmppfpfff. What da heck is in dis fitness bag (asides me)? It don't look like much! 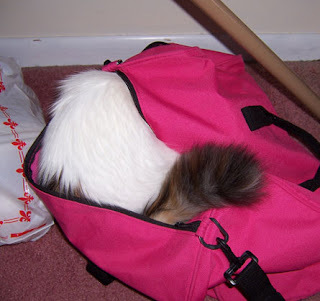 I mean, I don't finks dare is anyfing in dis bag cept an old brush an one sock. Um, Mom, isn't dare aposed to be some kind of fitness type stuff in dis bag? How bout yoo bring me to werk wif yoo in dis bag instead. At least yoo would get some use owt of it. Hee hee. Yoo know, yoo could take some lessons from Dragonheart and Merlin's Mom an Dad. Dey run in mary-thons an stuff. We bet dey haf stuff in their fitness bags and it's prolly not Dragonheart and Merlin - altho dey seem to love hanging owt together. 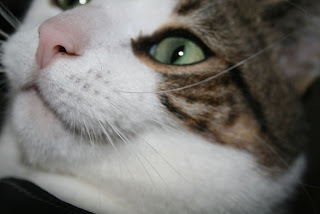 Check owt their latest Thursday 13 for some adorable pictures of dem. Messij to da Mom: If yur gonna keep reading all dese man-yooalls den what's a mancat to do to get attenshun but lay right on dem. Plus yoo can read dese all yoo want but if yoo don't akshully USE da infurmashun on yur webbysites and yoo LOSE da bizness den I finks it's better if yoo just LOOK AT ME! Dat's rite. FOCUS. Rite here. 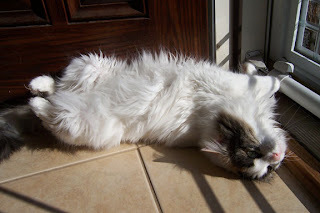 On Me - Da Talkin' Tummy. Lesson One. 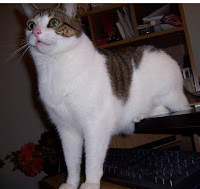 Computer sitting. Da pose: Back legs are resting comfortably. Front legs are in front of the 'puter. Spine is straight. Head is erect. Eyes forward. Smile on face. Purrfect. 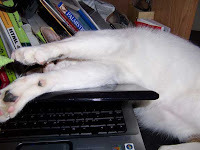 Lesson Two: Just don't practice dat pose alone and get a little off balance wif yur pose and put yur pawsies in da wrong place like on da keyboard for more den a few seconds coz den somefin bad happens to da keyboard. Da keyboard will den tell da beans dey am a failure or somefin like dat. 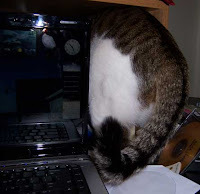 Den dey haf to go frew all kinds of steps and try again and again to figure owt why da keyboard is a failure. Finally after a squillion hours da keyboard will be bak to its happy self. So -- Lesson Two: If yoo am a failure, try try try again. It's a dreamin' kinda day today. 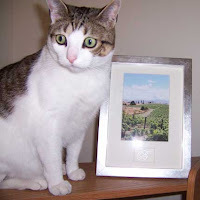 We am dreamin' of running and playing in dis vineyard in New Zealand, da country where Poppy Q lives. New Zealand has lots of vineyards although it is probably getting colder there. Owr beans used this picture for the background for their wedding invitations last May. They really like wine. Thank God It's Friday and Thank God it's Spring! It's been a loooooooooong time coming. Dis is da house me an Angie lives in. 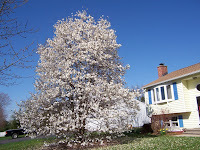 It has a big Magnolia Tree outside our big window and it has bloomed. It's GINORMOUS! Den we spotted da big HAWK flyin' roun owr house. Mom quick runned owt to get Angie. We don't know if dis kind of hawk eats kitties but Angie is a bright shining white in da sun and da hawk might finks she's a rabbit or somefin and carry her away. Yoo mind as well say here birdie birdie - breakfast is on da table! Happy Weekend everyone! Enjoy every minute of every day. Be happy. Remember - to make anyone else happy you need to make yourself happy first. If you're lucky enough to have a beautiful Spring day like today, shake away those cobwebs and appreciate and be thankful for life. Bring yourself one level higher in happiness and watch the good things come your way. Dis computer stuff is so tiring! Close it! Close it! Dare is more to da werld den a keyboard! C'mon , come play wif us! We gonna play thunderin' herd and hidey in my kitchen office, an play hide da treat, an chase Dottie da dot, an all kinds of fings. We also want to make dis a Thankful Thursday and be thankful dat we gots our health and a good safe place to live an a place to run an play. 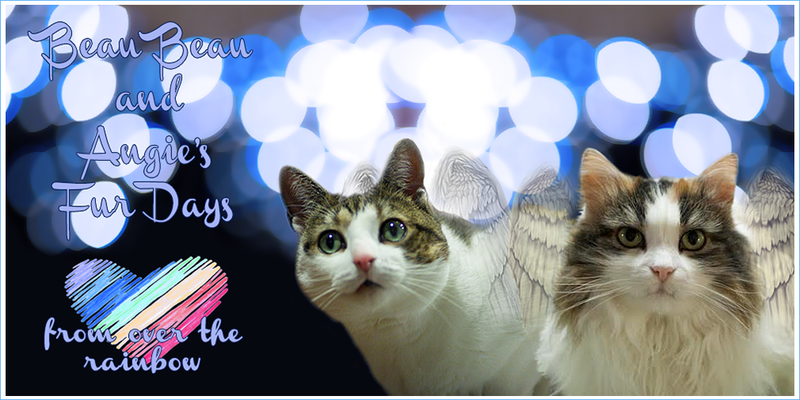 Lots of sad fings goin on lately but thankfully wif a lot of prayers and good luck some of dem turned out good - like Lilly Lu and da gang were found. We hope all the ofur animals and peoples dat were in da fire and smoke in dat building were ok as well. 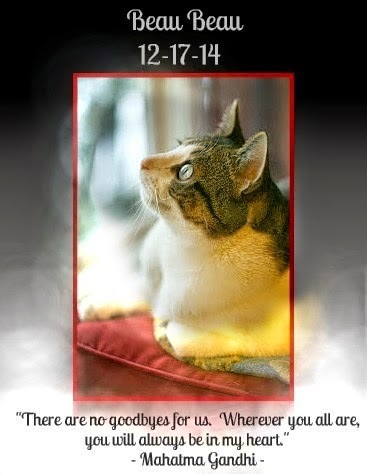 So we are furry aware of being thankful for all dat we do have when others have some trying times in their lives. A cat's life is supposed to be fun so we are thankful that we are able to enjoy life and we wish efurryone the same luxury as well. Scientists have discovered that cats have developed an elaborate communication system with hundreds of vocalizations to tell humans what they want. (YOO GOT DAT RIGHT WIKI GUY). 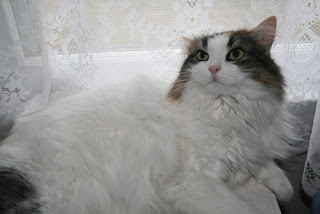 They know that we are in charge (WRONG), so it makes sense for the cat to learn to communicate vocally, and to make sure that we understand what they are saying. 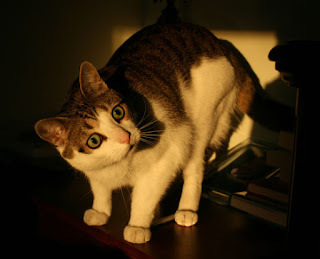 Cats can also learn to understand what we want them to do by our repetition of words or actions in a consistent manner (YEAH - SHINE DAT LASER LIGHT OFUR HERE HUMAN) In this way, we are able to communicate with cats in a dialogue that takes time and effort to develop but is very rewarding for both. (YES - WE HAVE OWR OWN REWARD SYSTEM AND IT INVOLVES TREATS - LOTS OF DEM). 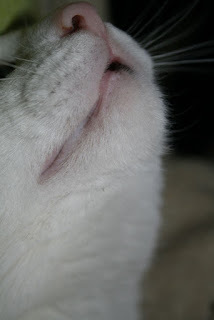 Remember that vocalizing is generally not your cat's preferred mode of communication. (REALLY? TELL DAT TO MAX'S or da MEEZER'S HUMANs!). 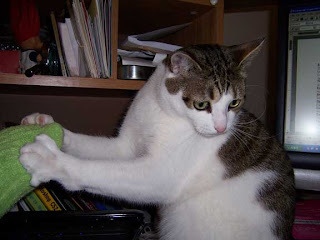 A cat's "first language" consists of a complex system of scent (WE GOT GOOD SNIFFERS - BETTER'N DOGS), facial expression, complex body language, and touch whereas we humans communicate primarily through sound. Cats soon realize that we don't understand the non-verbal signals they send to each other, so they vocalize in an attempt to communicate in our language. By observing which sounds elicit which actions from us, a cat is always learning how to make requests (or demands) (WELL DEY FINALLY GOT SOMEFIN RIGHT - WE DO DEMAND WHAT WE WANT WHEN WE WANT IT). Short meow - standard greeting. Multiple meows - excited greeting. Mid-pitch meow - plea for something. Drawn-out mrrroooow - a demand for something. High-pitch RRRROWW! - anger or pain. Chirrup (Also called "chirring", a cross between a meow and a purr with rising inflection) - friendly greeting sound, often used by a mother cat to call to her kittens. slowly blinking eyes - affection, equivalent of "blowing a kiss"
licks you - this is the ULTIMATE sign of affection. 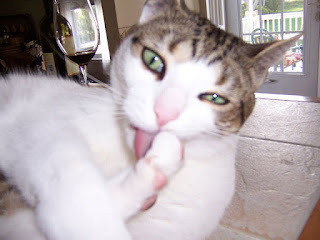 If your cat licks you, your cat considers you to be a part of his/her family, like a mother cleaning her kittens. 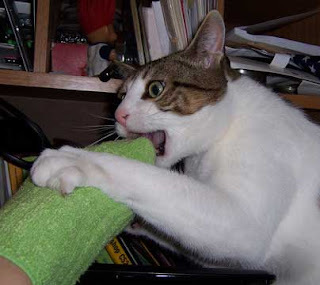 If you push your cat away when he/she licks you, they will feel hurt and confused. Your kitty loves you! Use the word shower consistently each time you are ready to take one, and eventually your cat may beat you to the bathroom and might even curl up in the sink to wait for you. (SINCE WHEN? 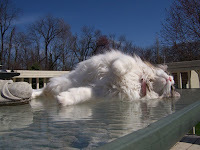 -- WATER IS NOT ONE OF OWR FAVRIT FINGS) (WE DO KNOW PLENTY OF CATS DAT DO LIKE TO drink FROM DA SINKIE). If you blink slowly when making eye contact with your cat, they will usually respond by coming over to be petted, as it is a very non-threatening gesture. Be consistent. For example, a cat often "asks" before invading another's space and a common blunder many pet owners make is to say "no" but pet the cat at the same time. This is very confusing to the cat. Instead, a very quick "no" combined with gently but firmly pushing the cat away from you, without showing affection, will let the cat know that their presence is not desired at this time. (WHO ARE DESE PEOPLE??? -- WE WILL ALWAYS COME BACK FOR MORE AN WE ARE NEFUR CONFUSED). HRMFFF. 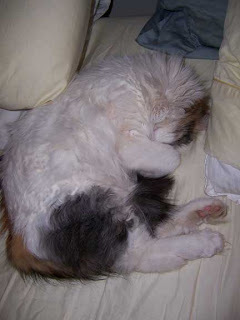 Most cats will try 2-3 times to invade a person's space, often from different directions. Be patient when saying "no" to them. You can also develop a "command tone" to use with your cat when they are doing something seriously wrong. Use a voice that comes naturally to you, that you can replicate easily, but that is also distinct from your everyday talking voice. (AN DEN WE WILL GET BACK AT DEM AT AN APPROPRIATE TIME IN DA MIDDLE OF DA NIGHT WIF OWR OWN STYLE OF COMMUNICATION). Treat your cat with love and respect (WE ALREADY KNOWS DIS AND DA HUMANS ALREADY KNOW DIS OR WE WILL POOP ON DARE HEADS!) and they will become a very happy and loving companion and friend. Talk to them softly and watch how they listen. They might respond with a meow or other sound. WE HOPE YOU ENJOYED DIS AS MUCH AS WE DID! Article provided by wikiHow, (WIF EDITS BY BEAU BEAU & ANGIE) a collaborative writing project to build the world's largest, highest quality how-to manual. Please edit this article and find author credits at the original wikiHow article on How to Communicate With Your Cat. All content on wikiHow can be shared under a Creative Commons license. We had lots of company yesterday to celebrate Gramma Wanda's 87th birfday. Efun tho she is 87 years old (is dat older den a squillion years old?) Grammie acts like a young spring chick-hen. 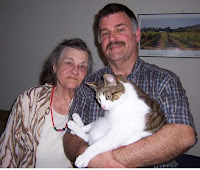 Dat's Gramma Wanda (affecshunitly known as GW) in da picshure wif daddy. It was an easy day coz efurryone kep pickin' me up and walking around wif me. It was also a good foodie day when Grammie camed ofur coz dare wuz lots of food dat falled on da floor and I made sure I was a good boy and cleaned it right up. No one stepped on me eifur so it wuz a good day. Mom says I am a furry good social cat. I efun showed efurryone my friend Dottie Da Dot. I chased her around da house while all da fambly watched. Dey were furry impressed dat I could run dat fast. 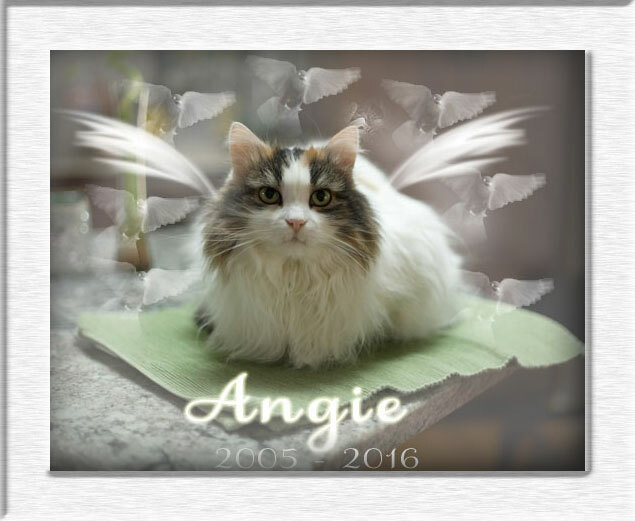 Angie kep going in and owt of da house an Grammie was furry worried about her. But Angie kept coming back in to see if dare wuz any food she could clean up off da floor. I beat her too it tho. We hopes we all gets to live to at least 87 squillion years old too. Happy Birfday Grammie. I'm not reeeely dis fat. It's da camera! Da camera puts 10 pounds on yoo Mommy says. 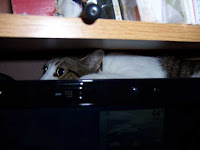 See I wuz able to fit behind da 'puter in my little cubby hole on top of all dem books. Dat couldn't happen if I was reely as fat as dat picture looks. Right? Heck with reading. I'd rather lie in the sun. 5. Tag five people and post a comment to Mickey once you have posted it. The book nearest us for some time has been Ask and It Is Given by Esther and Jerry Hicks. Mom keeps reading it over and over coz it duzn't seem to be werking the way she wants it to. But we told her dat's da point she's missing. Sigh. Humans. "So now that you have made it this far into the book, you have been reminded of many things that you have always known: You now remember that you are an extension of Source Energy and that you have come into your physical body, into this Leading-Edge time-space-reality, for the purpose of joyously taking thought beyond that which it has been before. You now remember that you have a guidance system within you that helps you to know, in every moment, how much of your connection to that which is your Source you are right now allowing. You now remember that the better you feel, the more you are in alignment with who you really are; and the worse you feel, the more you are disallowing that important connection." GEEZ. Well if you made it dis far pweeze go see owr friends dat tagged us, Parker and Tun Tun. if dey wants to play. We had a little 'puter downtime for da last few days coz Mom knee herts. Bein' da Mancat dat I am, I tole her if she finks her kneee hurts wait till I take a bitey owt of her foot! Her knee won't hert no more! Bwhwhahaha! But just when I went to take a bitey -- Geez Woman! We mancats gots sensitive noses ya know. 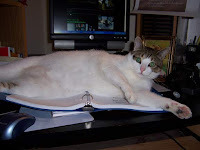 We's been tagged for da book meme by three bloggers so we gots to werk on dat. Tomorrow. 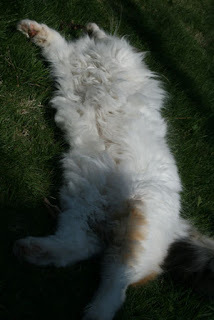 Unless yoo wants to see Angie's tummy instead. Well if Beau Beau running over Mom's belly three times didn't wake her up, I bet Woody da Woodpecker hammering on da metal gutter dis morning would have done it if it wuz a little earlier. But while Mom wuz in da middle of meditating, (Beau Beau thot she wuz sleeping coz she's a lay down and meditate purrson) he made sure he ranned across her stomach to wake her up. So we were all up when Woody started his mating noises on da roof. Apparently, male woodpeckers hammer on trees and houses and stuff between late winter and early summer to attract a mate. Woodpeckers drumming also tells other birds to stay off his turf. And what a nice loud noise it is! I tried to scare him away but he just laffed an laffed and hammered some more. I'm sure dis won't be da last of him. Sometimes he hammers on da metal chimney piece dat sticks out of da roof. Dat way the sound goes all the day through the house and efurryone in da neighborhood and all ofur female Woodpeckers from miles around can hear it.